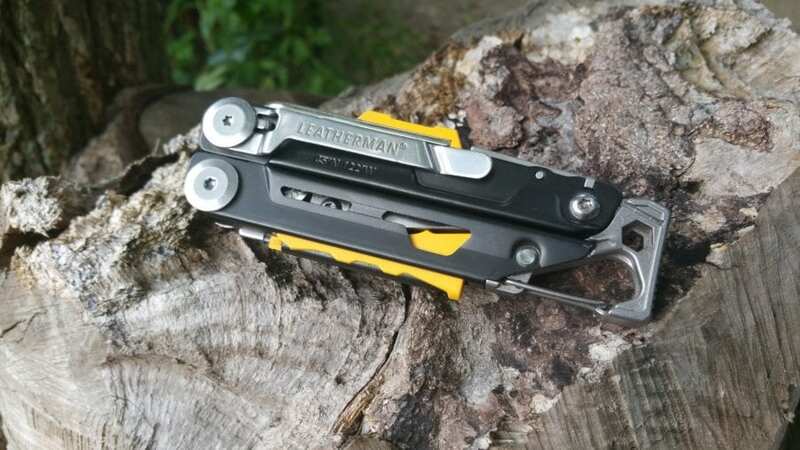 Leatherman has designed a tool for those who participate in activities away from civilization. They found that Leatherman users often appreciate the preparedness that a multi-tool can bring them, and they’ve used that feedback as inspiration for this new tool. 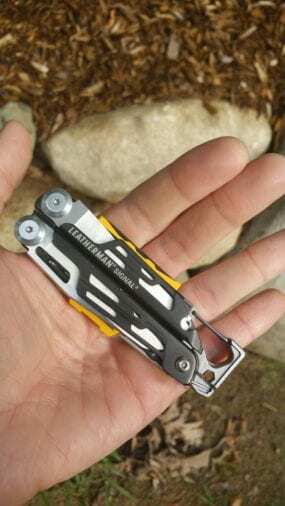 The new Signal multi-tool comes equipped with vital survival tools like a ferrocerium fire starter and whistle. 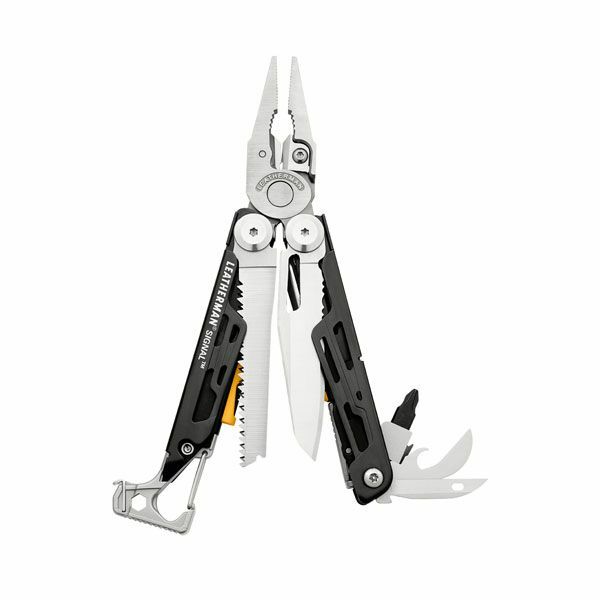 The Signal also comes complete with traditional Leatherman features like pliers, can opener, saw, awl and removable pocket clip. In addition, it includes popular features like a hammer, replaceable wire cutters, diamond-coated file, and bit driver. From natural disasters to the unpredicted, Leatherman hopes to help people to feel prepared for the unexpected. Needle-nose Pliers – A cast pinching tool with an angled nose for holding or manipulating materials, ideal for small objects or tight spaces. 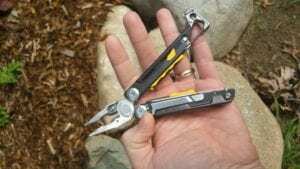 Regular Pliers – A cast pinching tool for holding or manipulating materials. 154CM Replaceable Wire Cutters – Replaceable bypassing cutting blades crafted from 154CM, meant for cutting regular and light-gauge wire. 154CM will keep its edge three times as long as traditional stainless steel for less down-time in the field. 154CM Replaceable Hard-wire Cutters – Replaceable bypassing cutting blades crafted from 154CM, meant for cutting hard wire. 154CM will keep its edge three times as long as traditional stainless steel for less down-time in the field. Wire Stripper – A useful notch for safely stripping multiple types of wire. 420HC Combo Knife – A knife made from 420HC stainless steel with a half straight and half serrated edge. This style of blade gives the user a choice of precise cuts using the plain section, or cutting through fiber and rougher material using the serrated area. Saw – A toothed tool made from 420HC stainless steel that is designed to work on a pull motion, which requires less effort and has less propensity for breakage. The open-tooth design keeps the saw from filling up with material, allowing the user to complete a job without pausing to clean the tool. Hammer – This hammer can be used for pounding a tent stake, striking a nail, or other uses. It features a textured end to reduce contact slippage. Awl w/ Thread Loop – An awl is a tool that can be used to create or enlarge holes by puncturing materials such as leather or canvas. They can also be used to start stair steps for hunting stands. The thread loop can be used for sewing materials together when necessary. Can Opener – A lever/punch style tool to assist in opening canned goods, perfect for camping or in survival situations. The blade on this tool has been ground in a way that it pushes the cut metal into the rim, keeping sharp edges from cutting the user as the can is handled. Bottle Opener – A tool that allows the user to pop the top on a favorite beverage. 1/4” Hex Bit Driver – This slot allows for use of conventional 1/4″ hex bits to expand the functionality of the tool. 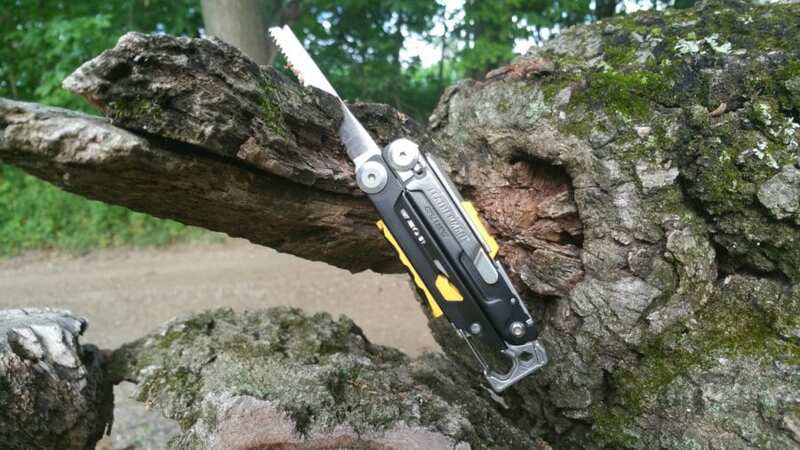 Bit Driver – This feature allows the user to insert any Leatherman double-sided bits, thereby expanding the functionality of the multi-tool without taking up space with stand alone screwdrivers. A Bit Adapter accessory may also be used to make the bit driver hex bit compatible. 1/4″ Box Wrench – A wrench used over the head of a 1/4″” hexagonal nut or bolt. The application of torque is used to tighten or loosen an object. Carabiner – This handy feature allows the user to quickly and securely clip their tool to an item using a spring loaded gate. 3/16″ Box Wrench – A wrench used over the head of a 3/16″ hexagonal nut or bolt. The application of torque is used to tighten or loosen an object. Safety Whistle – A whistle meant to be used to attract help if needed. 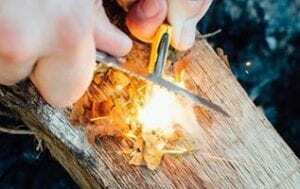 Ferrocerium Rod – A rod made of ferrocerium, a man-made metallic material that gives off hot sparks when scraped against a rough surface, meant for starting fires. Diamond-coated Sharpener – A stainless steel rod coated with premium synthetic diamond particles which create a rough surface that can be used to sharpen hard steel blades with much more precision than wood/metal files. All Locking Features – All locking features means that every tool and knife on the body of the handle, with the exception of the plier head, will lock into place. The all locking design enables the user to operate individual tools safely and effectively. By locking them into place when fully open, the user can put pressure on the implement while safely completing the job, before manually unlocking the tool to stow it away. 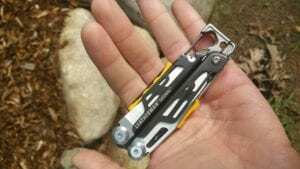 Replaceable Pocket Clip – A removable clip which allows the user to wear their multi-tool attached to a pocket or belt loop without the use of a sheath. 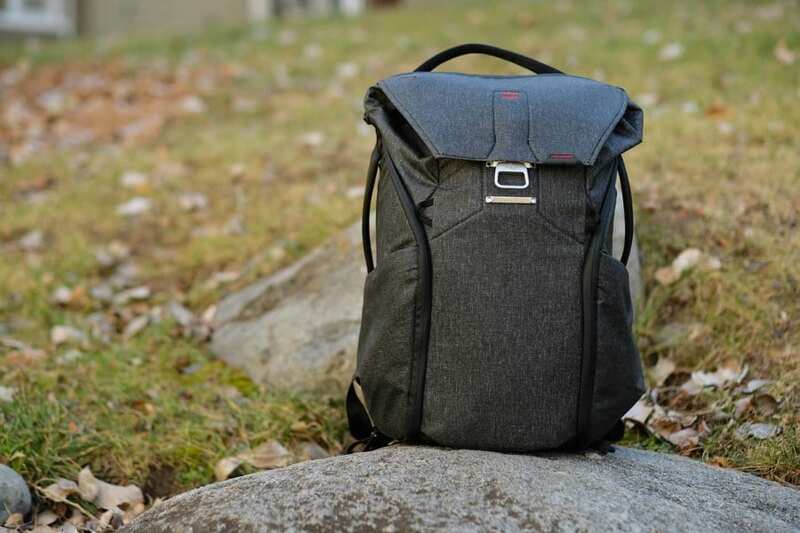 By removing the clip, the user is able to easily carry their tool in a sheath if preferred. 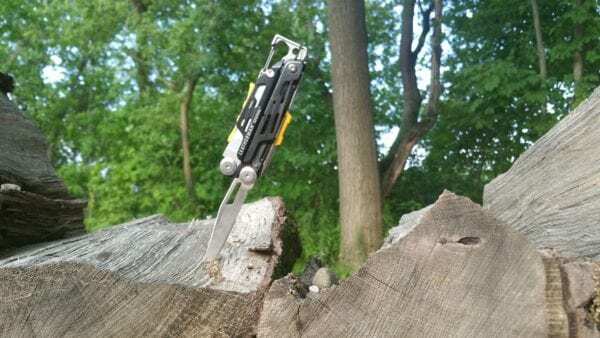 Outside-accessible Features – This multi-tool features tools that are accessible while the tool is in its folded or closed position, mimicking the functionality of a pocket knife. One-hand Operable Features – Every feature on this tool can be opened and operated with one hand. This enables the user to keep the other hand free for situations that require multi-tasking or a free hand. 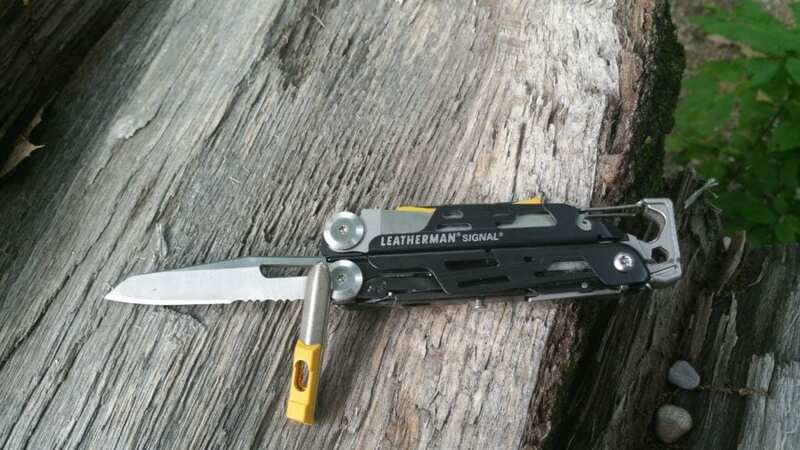 I have been carrying around the Leatherman Signal for over a month and it is always with me, clipped right in my pocket. There is not a day that goes by that I do not use the Signal in one way or another. 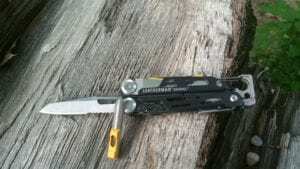 The quick access knife is my most frequently used tool. From opening boxes to cutting up an apple, it is a simple and quick flick of the thumb and you are ready to start carving. I have been beating and battering the Signal on hikes, mountain bike rides and during camping (where is feels most at home). 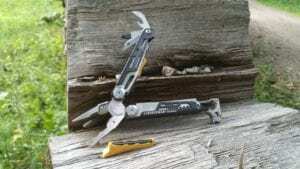 The functionality is amazing and this Leatherman has a solid build that will with stand decades of use and abuse. 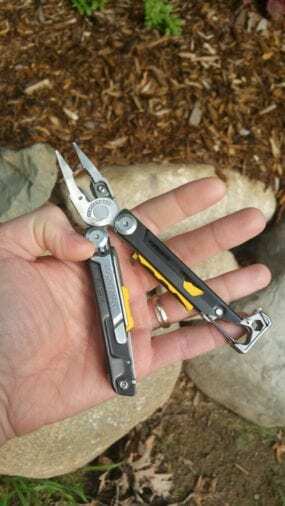 Opening the tools, especially the pliers, feels as if Leatherman has improved on precision over the years, as the Signal glides open smoothly, versus forcing it open as I have with others. After owning many Leatherman’s over the years, this one is by far my favorite, as it has all of the tools on board that fit right into my lifestyle, it just beams outdoor adventurer all through out. The Signal is close to the most perfect multi-tool that I have ever used, if it would have been equipped with spring loaded pliers, I would have labeled it as Leatherman perfection. 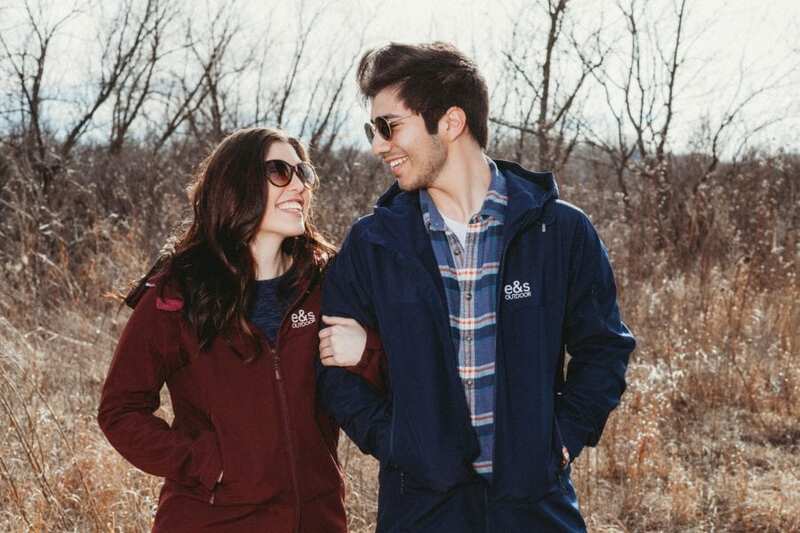 Definitely an outdoor enthusiasts must have companion. 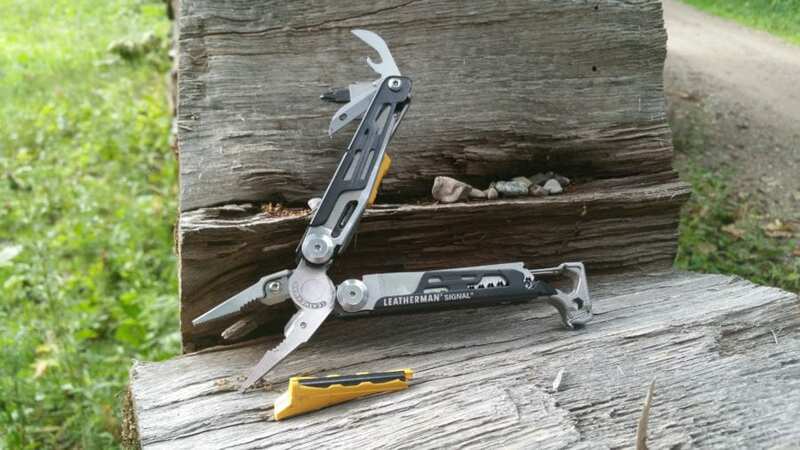 The Leatherman Signal is compact, insanely convenient, and rich in features. 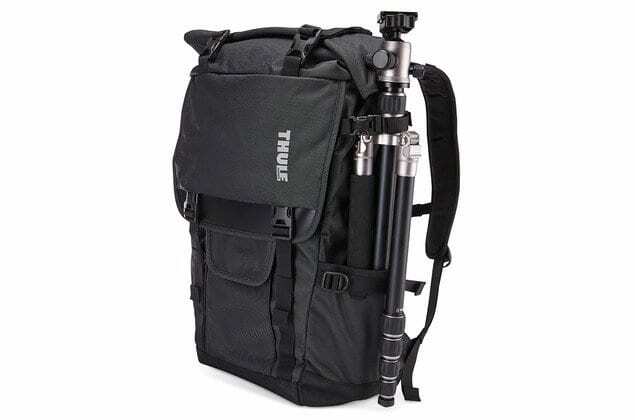 It brings a multitude of regularly used tool components into a small, pocket-able, do-it-all device. From opening a can of beans, to sawing off a branch, to starting a fire, there are few scenarios that require a tool for which you won’t be prepared with the Signal. Before heading into the wilderness, make sure you’re equipped for the unexpected challenges and daily tasks with the Leatherman Signal attached to your pack or stashed in your pocket.